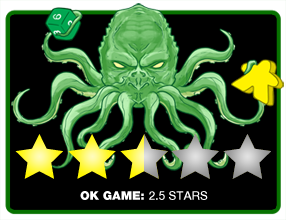 We review the board game Aquadukt. Aquadukt is a tile placement euro game where a player is tasked with supplying water to houses in ancient rome. Read the full review to see our thoughts on the game. can accommodate from 2 to 4 players and the rules take about 5 minutes to read and understand. This won’t need to be an exceedingly long review as the game is quite simple. The goal of the game is to supple the most houses with water view the Aquadukt system. 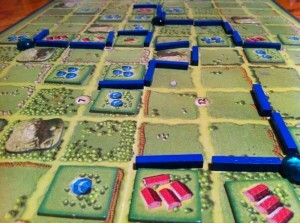 Players take turns with one action per turn from the available options: digging wells, placing houses or building canals. The game ends when all a player has built all their canals. he components in Aquadukt are functional, but nothing really special. The board consists of a number of squares, divided into separate fields. It’s designed to show a lush, green landscape. The canal sticks are wooden rectangles and the wells are glass beads. Functional, but nothing that will influence your buying decision. Each player chooses a color and takes all the canal pieces and house tiles for their chosen color. The house tiles are numbered with 1, 2, 3 or 4 houses on them. The houses represent the victory points the players will get when they are supplied with water. On a players turn, they have 3 action choices. 1. 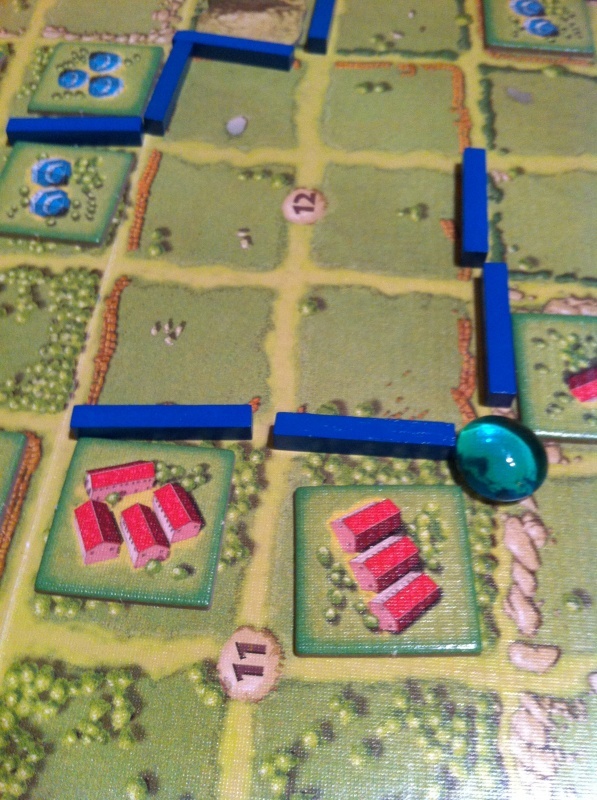 Build houses – A player rolls a 20 sided die and may build a house in that field (there are 4-6 squares in each field). 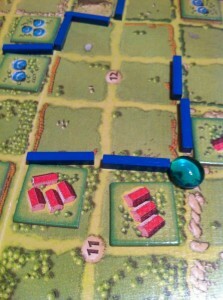 The player can place any house tile (1-4) in a square on the rolled field. The only exception is if the square is already supplied with water, then they have to place their lowest numbered house tile. A player can roll two more times, placing up to 3 house tiles on their turn. 2. Uncovering Wells – A player can dig a new well by placing a glass “well” bead at any intersection on the board. The only rule is that it must be at least 5 intersections away from the nearest existing well. 3. 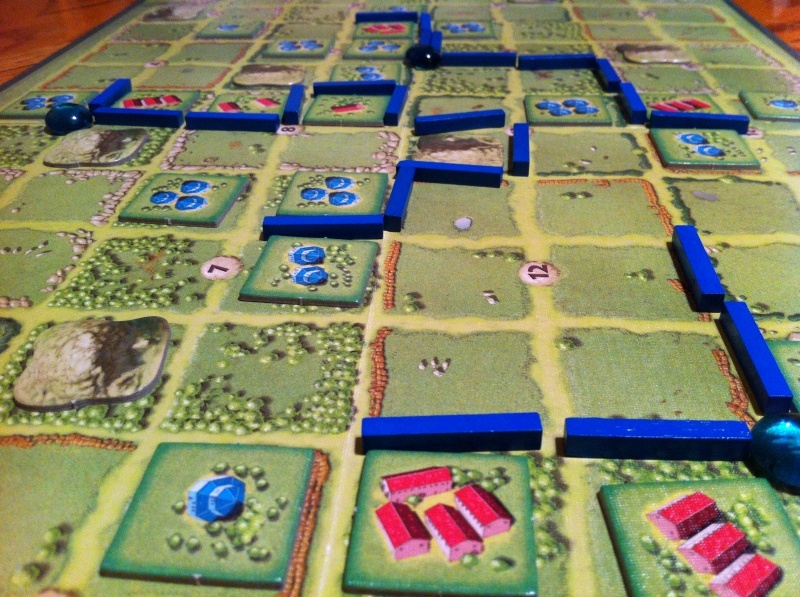 Building Canals – To build canals, a player places either 1 or 2 canals on the board. The canals must be connected to a well. The canals are build along the sides of the squares (much like roads are in Settlers of Catan). There are a few rules to make note of, such as canals can change direction, but can’t branch off (no “T” intersections). A canal will supply water to an houses on either side of it. For some variation, you can also build double canals (by placing a second canal next to an existing one) and it will supply water 2 squares away from it. However, each canal between the double and the source well must also be a double canal. And that’s all the actions. Player alternate taking turns until one player is out of canal pieces. Once that happens, they finish out the round and you total up the victory points. Any house not supplied with water is removed. All reaming house tiles count for their face value. is not a very deep game as you can tell. That doesn’t mean it’s a bad game, it’s just not one that’s going to keep you coming back for more and more. I feel like it should be a filler game, but it’s just a tad too long for that. The components are functional, but nothing exceptional. It gets positive points for the games easy to understand rules and is friendly for non-gamers as well. will most likely leave you wanting a bit more. There is just not a whole lot of excitement to be found while playing Aquadukt. I’d say it’s a good game to get out when you only have a little bit of time to play something and aren’t looking to read 10 pages of rules. But I’d be surprised if it made it out to the table more than once or twice a year. Final Score: 2.5 Stars – A short euro game, but bland components and minimal excitement will keep this one off the table very much.